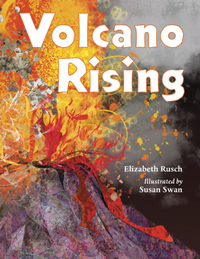 Elizabeth Rusch has two new books about volcanoes coming out this summer. They show the vibrant range of children’s nonfiction, as well as Rusch’s versatility as an author. Eruption! 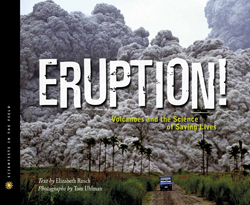 : Volcanoes and the Science of Saving Lives, with photographs by Tom Uhlman, is part of Houghton Mifflin’s Scientists in the Field series for ages 10 and up. It follows the nail-biting experiences of USGS volcanologist John Pallister and his team from of the Cascades Volcano Observatory as they race to provide the most advanced equipment and information to those evaluating the potential of volcanoes to erupt around the world. Formed after the deadly eruption of Colombia’s Nevado del Ruiz in 1985, the Volcano Disaster Assistance Program or VDAP, is an international effort to provide assistance to any country impacted by volcanoes that asks for help. Rusch reveals how VDAP works by closely following the events of the Mount Pinatubo volcano eruption in the Philippines. She shows the science of positioning and monitoring seismographs, determining gas content and amount of ash, and even how satellite images can help predict when the next volcano will erupt. The case study also demonstrates that human responses to orders to evacuate are almost as unpredictable as the volcano itself. In contrast, Volcano Rising, illustrated by Susan Swan, is a children’s picture book for ages 6 to 9 that explains not only what volcanoes are, but also how volcanoes can be a positive force by creating new land and adding nutrients to the soil. Perhaps too often we focus on the sensational, explosive aspects of volcanoes. In this book, Rusch presents an alternative way of looking at volcanoes that is both age-appropriate and more informative because it presents are more rounded, less dramatized view. Looking for information on volcanoes? Wanting to learn more about the science and scientists behind volcano eruption predictions? Elizabeth Rusch has the books for you! See Growing With Science for some suggestions for hands-on activities to accompany these books. Categories: STEM Friday round-up | Tags: Elizabeth Rusch, Eruption! : Volcanoes and the Science of Saving Lives, Volcano Rising | Permalink. I love books that distill complicated scientific processes and concepts into something that the average reader can understand. If they are compelling and engaging, so much the better! Bomb: The Race to Build—and Steal—the World’s Most Dangerous Weapon (Roaring Brook/Flashpoint 2012) by Steve Sheinkin is just such a book. Full of gripping accounts of espionage, wartime heroics, and scientific breakthroughs, Bomb also explains the properties of Uranium 235, the phenomenon of heavy water, and the science of nuclear fission and chain reactions. In addition to scientific principles, Bomb examines the nature and workings of the worldwide scientific community, as well as the more personal process of collaborative experimentation and discovery. Even those without an interest in science will find Bomb: The Race to Build—and Steal—the World’s Most Dangerous Weapon to be a fascinating account of a major milestone in science and history – one that has forever shaped the world we live in. Both the print and audio versions are sure to inspire further interest in the science of nuclear power. My starred review of Bomb (the audiobook version) as it appeared in the July, 2013, edition of School Library Journal. For a modern look at the legacy of nuclear power, Fred Bortz’s Meltdown! The Nuclear Disaster in Japan and Our Energy Future is another well-done scientific, nonfiction, narrative for young readers. Copyright © 2013 Lisa Taylor All Rights Reserved. A Rock is Lively by Dianna Hutts Aston, illustrated by Sylvia Long, published by Chronicle Books, is the fourth book in the series by this team. I enjoyed the other ones, but having some experience with geology, and my own significant rock collection, I found this newest book to be particularly compelling. One does not generally think of rocks as particularly lively, but Aston’s words, and Long’s illustrations take us on a journey around the earth (and even into space!) to see just how varied and changing and full of life rocks really are. The illustrations are perfection, full of color and detail, and capture the essence of a wide variety of rocks. Everything from the “mixed up” Lapis Lazuli, to the “galactic” rocks that fall from space, to the stunning insides of geodes are offered up to the reader with gusto. Aston’s words are poetic and yet simple. She skillfully captures the facts that make this book nonfiction, while at the same time giving them to us with a bright and clear voice. I loved this book, and I think it might be my favorite of theirs. It is a beautiful example of nonfiction picture book done well. And one that my son and I can read again and again, continuing to be amazed at the stunning liveliness of rocks. Categories: STEM Friday round-up | Tags: Amanda Jaros, STEM Friday | Permalink. Wondering how you can score big with math students? First and foremost it’s important to find your reader’s interest. Do they love to play soccer? Maybe they like to watch football? Who is their favorite baseball team? Maybe they participate in track and field events at school. What about basketball? Have they ever been to the racetrack? What they might not realize is that lots of math is used in sports! How many points is a field goal? Even batting averages involve fractions and decimals. Enslow’s new series, Score with Sports Math, gets students warmed up and ready to tackle sports word problems which include addition, multiplication, division, subtraction, fractions, and decimals. 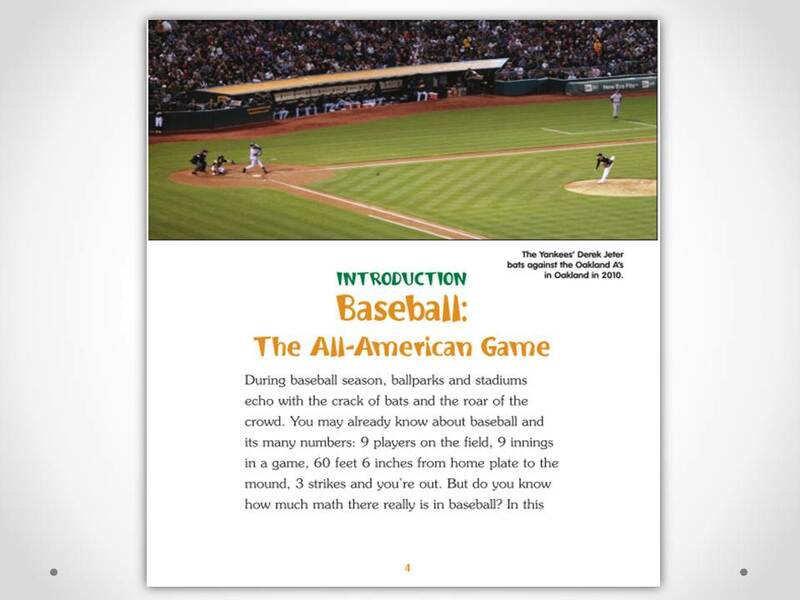 Each book begins with an introduction to the sport with some history and stats. Subsequent chapters are filled with word problems that include illustrations to keep these problem solvers interested. Each word problem is preceded by informational text that the reader will need to comprehend and analyze in order to solve the word problem that follows. As far as Common Core State Standards, this is a home run! 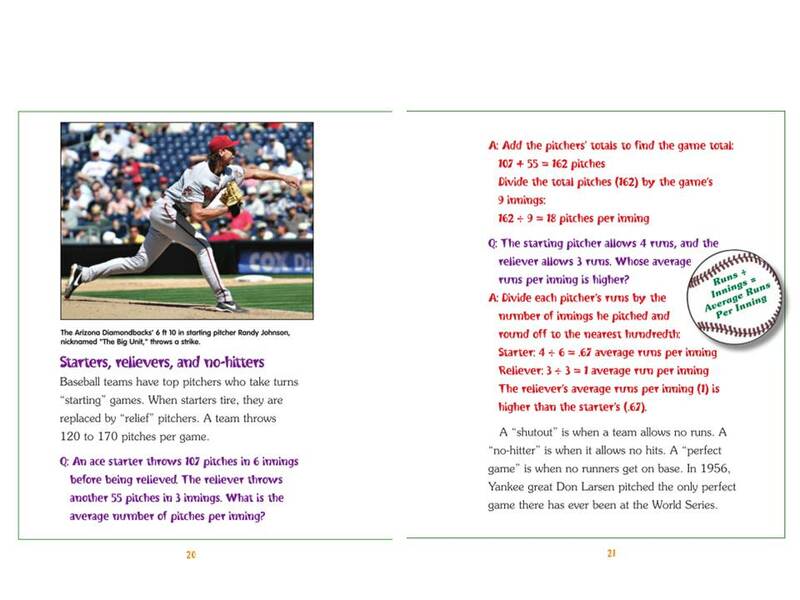 These books not only present informational text in a fun and unique way, word problems promote reading comprehension and critical thinking while additional text combines history and sports biographies with math. Score ! Everyone wins! Categories: STEM Friday round-up | Tags: books for STEM, Common Core, math, nonfiction books, sports, word problems | Permalink.